Congratulations Addey Small - U.S. Presidential Scholars Semi-Finalist! 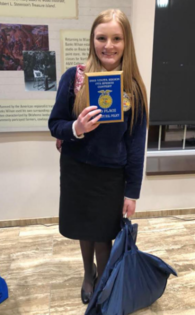 Congratulations to the following students on their achievements: Congratulations to Landry Layton for winning 2nd place in the Ag Policy Division last week and qualifying for Districts! Welch FFA Attends 2019 Aggie Days at NEO Food Science Competition: Justin Haskell, Austin Haskell & Clayton Lester Ag Communications Competition: Olivia McGuire, . . . The 7th and 8th Grade Quiz Bowl team once again competed at the State Tournament at the University of Oklahoma in Norman on April 13. There were 18 teams competing at State in Class A. Welch went to the contest ranked #1 due to their high scorings at Regionals. Competition began at 10 am, but Welch had a bye in Round 1, then beat Cleora in Round 2 200-130. In Round 3, Welch competed . . . Tournament of Champions Nine Welch Middle School students competed in the Tournament of Champions at Redlands Community College in El Reno Friday, April 5. The Tournament of Champions is the statewide written scholastic championship for middle school students. It is sponsored by the OAAC. Over 500 students from across the state competed on Friday and Saturday. Welch students competed . . .
Click here to order your 2018-2019 yearbook online.